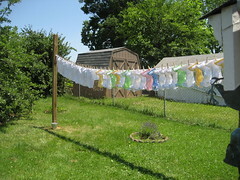 For Mother’s Day this year, Andy built me a lovely clothesline, which I’ve long wanted. I eagerly took my first load out while Sophie napped. 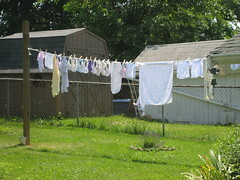 It was a windy, sunny day, perfect for drying clothes on a line. I left them out for a few hours, and then Sophie and I went to the dentist (my mom graciously watched Sophie in the office lobby while I had my teeth cleaned). On the drive home I noticed the streets and leaves and buildings looking wetter and wetter the closer I got to Ft. Thomas. Wet is an understatement. It poured. Sophie’s clothes were soaking wet—wetter than when I first put them out. But I left them, figuring they would eventually (re)dry. Several hours later, it started sprinkling again. I checked the weather forecast online—it was supposed to storm (and it did) for three days. I took the soaking wet clothes off the line and dried them in the dryer, thoroughly disappointed. It has since gone much better. 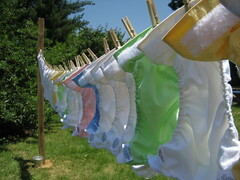 Here are Sophie’s cloth diapers drying on the line. I feel so good about line drying them. Her diapers are brighter and smell better now, too. I don’t line dry everything (even though I probably should) but seeing her diapers and our towels drying in the breeze—I don’t know what it is but it just makes our house feel more like a home. This entry was written by kara, posted on June 10, 2009 at 11:56 pm, filed under Uncategorized. Bookmark the permalink. Follow any comments here with the RSS feed for this post. Post a comment or leave a trackback: Trackback URL.